We are proud to host the annual Ambassadors’ Cup in Singapore. Since it inception, the event has evolved into the biggest informal social event in the diplomatic circle. This event is organised for all the embassies representing their individual country around the world. 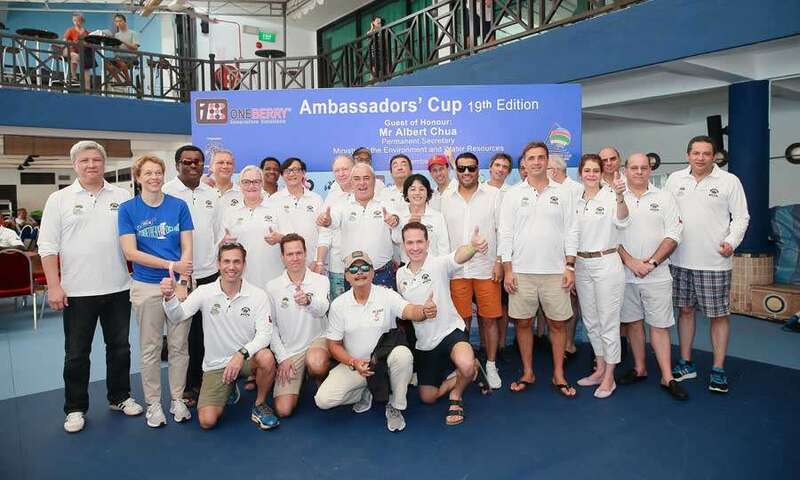 Since its inception in 1999, under the firm stewardship of H. E. Tony Siddique – The Ambassadors’ Cup has always been the Premier Sailing-Social Event in Singapore. Gathering all the Ambassadors in Singapore at a beautiful location for a day of sailing and revelry – an event unique to Changi Sailing Club and possibly Asia. At the 18th edition of the event, CSC achieved a record-breaking 63 Boats and 41 Countries in attendance. This year, H. E. James Sinclair will be presiding over the event for his 3rd and final term. You can expect the same Chilean Flair and Energy on 3rd November 2018 at Changi Sailing Club. This year, we are very fortunate and excited to have Oneberry onboard as Title Sponsors of the Ambassadors’ Cup. We have also confirmed the support of Gold Sponsors Yanmar & Chong Lee Leong Seng (CLLS). This, together with the unwavering support of Cosmosteel and Kaefer Prostar has put the Ambassadors’ Cup Team in a stronger position to deliver an unforgettable sailing and party experience at Changi Sailing Club. Stay on this page for further media updates and the Notice of Race/Entry Form.